Poisonous is an adjective describing something that can cause death or injury if it is ingested or absorbed. Venomous is an adjective describing creatures that inject their victims with a toxin. The adjective poisonous is used to describe something (often a plant, animal, or chemical) that contains a toxin that is harmful when absorbed, consumed, or inhaled. Human fatalities caused by poisonous plants � especially resulting from accidental ingestion � are rare in the United States. The wild golden frog may be the most poisonous living animal. The adjective venomous is used to describe an animal that injects a self-produced toxin into its victim usually through stingers or fangs. The adder is the only venomous snake found in the United Kingdom. adverse or averse? affect or effect? appraise or apprise? avenge or revenge? bare or bear? complement or compliment? dependant or dependent? discreet or discrete? disinterested or uninterested? e.g. or i.e.? envy or jealousy? imply or infer? its or it's? material or materiel? practice or practise? principal or principle? tenant or tenet? who's or whose? Venom is secreted by an animal to harm another. It is usually injected by means of a bite or sting. It contrasts with poison, which is absorbed or ingested (consumed or inhaled). Poison can be a solid, a liquid, or a gas. Venom, on the other hand, is usually a liquid. Is There Really a Difference Between Poisonous and Venomous? 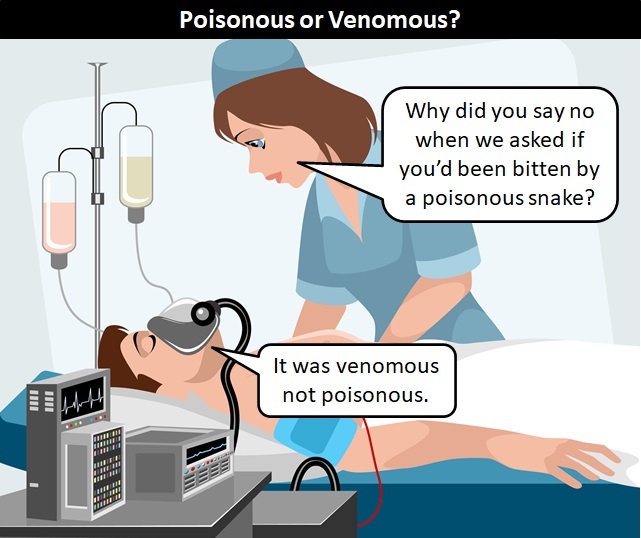 With so many people using poisonous where they should be using venomous, the distinction between these words is eroding, and some dictionaries cite venomous and poisonous as synonyms. However, it is worth knowing the difference so you showcase your vocabulary skills.